A £4.4 million funding boost for regeneration projects in Scotland’s historic heartlands was announced today by Historic Environment Scotland. 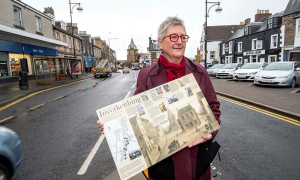 Jane Ryder OBE, Chair, Historic Environment Scotland, said: One of the great merits of the CARS scheme is that it is locally led and allows local authorities to invest in priority properties they have identified and help communities to unlock the potential of their historic assets. So, as well as investing in conservation projects worthwhile in their own right, additional benefits range from encouraging tourism, to supporting local skills training and the creation of new businesses. All of this shows why the CARS scheme is so important. Commenting on the announcement, Cabinet Secretary for Culture, Tourism and External Affairs, Fiona Hyslop said This grant funding has been protected by the Scottish Government and supports towns and cities across Scotland to regenerate and improve their built environment benefiting Scotland’s diverse heritage assets and communities. Now in its eleventh year, the Conservation Area Regeneration Scheme has led to the repair and restoration of local heritage in towns across Scotland and in doing so contributes to their social fabric and community cohesion. It also boosts the economy as the funding supports local businesses in carrying out repairs and improvements.